Do you love fibers? Can’t keep your hands off yarns? Love the excitement of colors? Want to meet like-minded fiber lovers who spin and weave? Then Convergence 2010 is for YOU! It’s July 18-25, 2010 Albuquerque, NM. Make your plans now! I’ve been to every Convergence (sponsored by Handweaver’s Guild of America) since Seattle 1980 and they are absolutely the best fiberarts experience you’ll have in your entire life! Cotton Clouds is going to be there! So come see us at booth #417! Check back soon for some exciting news on our featured items and sales we’ll have there! It’s going to be the best Convergence ever! Just a hint about our featured items: Get your hands on woven samples of our Color Horoscope Shawl and pick up our newly designed and niftily packaged kit. 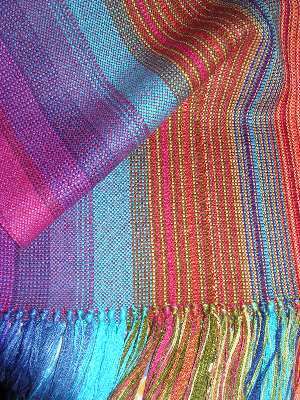 You’re going to love the colors, texture and feel of this shawl woven in our Bambu 12 yarns! These Color Horoscope Shawls are designed by Bonnie Tarses using her unique color warping sequence based on how the planets were aligned on the day of your birth. Take one of her workshops for in-depth understanding of this technique, or order one of our exclusive kits with instructions included. Plus, we”ll have a special Convergence 2010 Commemorative kit, exclusive at the show. You won’t want to miss this! Updates on Convergence to follow.